The Combat Hippies are a Miami based ensemble of Puerto Rican military veteran performance artists. 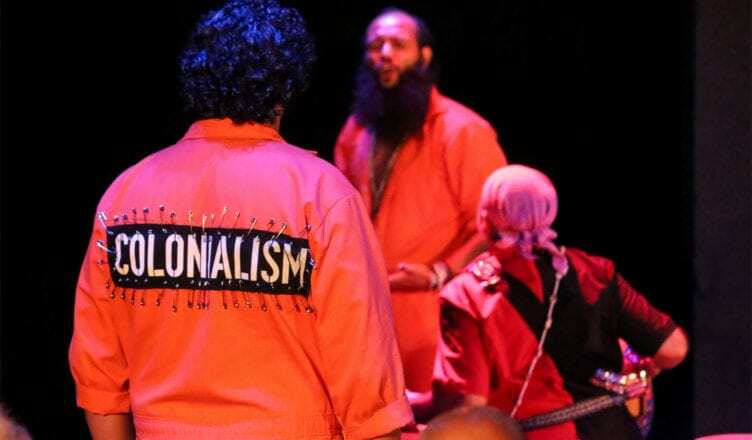 They rotate in members and to date have produced two major theatrical productions, last year’s “Conscience Under Fire” and now “Amal.” The Combat Hippies were born out of a MDC Live Arts’ creative writing workshop in 2015. Four years later the boys have graduated into a legitimate tour-de-force. Their new piece is”Amal,” a Syrian word for “hope.” It just finished a solid run at the Miami Dade Auditorium. Now they will take the show on the road with performances in San Jose, CA and Denver. “Amal” examines stories of veterans, from enlistment to civilian adjustment to life after. It also looks at the effect of war on refugees. The production runs about sixty-five minutes and is staged through a series of non-linear vignettes. The three main players jump around time and space, from 1950s Puerto Rico, through Vietnam, whether in the jungle or the heroin laced streets of the Bronx. Finally, the play definitely focuses on the wars in Iraq, Afghanistan and Syria. Anthony Torres and Hipòlito Arriaga are original members of the Combat Hippies. They wrote this performance piece with sharp wit, engaging dialogue, splashes of humor and slashes of provocation. The production feels like a natural, organic and timely artistic creation of the zeitgeist we live in. It’s provocative, like war. Add into the mix the master directorial eye and mind of Miami’s own Teo Castellanos (a Jitney author, we published his first book), and “Amal” really resonates with a unique neo-urban-intelligent tone, rhythm and flow. The soundtrack is dope, as is the choreography and synergy between Torres and Arriaga. The timeline makes the narrative a tad disorienting to follow, the strobe light transitions don’t help. But the writing and synergy between the two major players, in addition to the watchful eye of its director, make this production just another example of the top-tier culture that Miami consistently produces.